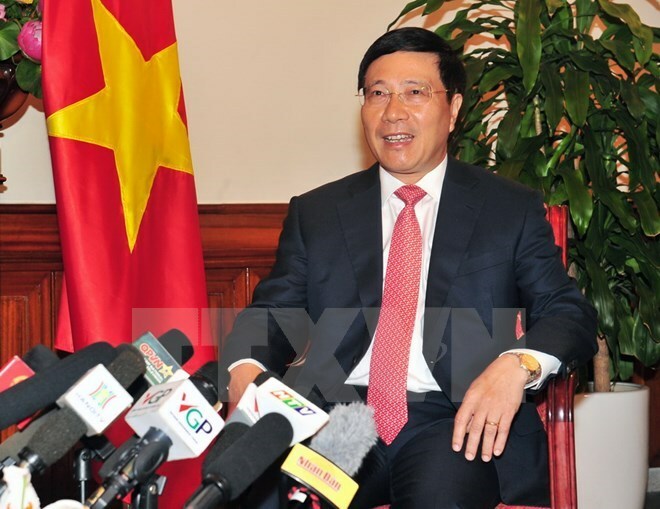 Hanoi (VNA) – Over the past 50 years, the Association of Southeast Asian Nations (ASEAN) has clinched an important position that few sub-regions can, one of the greatest successes of the association, Deputy Prime Minister and Foreign Minister Pham Binh Minh has told the media. Along with mechanisms fostering intra-bloc solidarity, the association has run mechanisms for major world powers to engage in the region, including in politics, security and defence, he said, stressing that this is unique to ASEAN and shows the value of the association in the region and the world. Through 50 years of formation and development, ASEAN has gained many achievements. It has united regional nations with differences in culture and political administration, creating an environment of peace, stability and friendship in the ASEAN Community, said Minh. He highlighted that from a group with poor and backward countries, ASEAN has become the most dynamic economic community in Asia-Pacific, creating a 630 million-strong market with total GDP of 3 trillion USD and 4.7 percent growth per year, the highest pace in the world. ASEAN has been attractive to economic partners thanks to free trade agreements, expanding its market to 3 billion people with total GDP of 20 trillion USD, he noted, saying this is an economic relationship that no other sub-region can boast. However, he also pointed out that ASEAN has faced numerous challenges, including unequal growth among member countries, differences in their interests and competition from major powers, along with security challenges. In the future, the association aims to continue building a community with close ties in politics, economic connectivity and shared social responsibility, which means putting people at the centre of policies and laws, he said, adding that this is also stated in the ASEAN Vision 2025. At the same time, building intra-bloc solidarity is also vital for the ASEAN Community, as this is a matter of shared interest of member countries and key to maintaining the central role of the association, he stressed. Regarding Vietnam’s contributions to ASEAN in its 22 years in the association, Minh said that Vietnam has been a positive and responsible member. Vietnam has worked to expand the association from five members to the current 10 members. Along with other member countries, Vietnam helped form the ASEAN Community in late 2015. The country has set and reached important goals to establish the community. So far, Vietnam is one of the leading countries in realising ASEAN Community goals, with 95 percent of them underway. In the role of coordinator of cooperation mechanisms of external partners such as China and India, Vietnam has strengthened connections between ASEAN and these partners. Additionally, Vietnam helped increase the membership of the East Asia Summit by adding Russia and the US when Vietnam acted as chair of the association in 2010, said Minh, adding that Vietnam also proposed the expansion of the ASEAN Defence Ministerial Meeting Plus. Minh said that Vietnam, through two periods chairing the association, has also contributed initiatives, including the building of the Code of Conduct in the East Sea for maintaining peace and stability in the region.